Skin color is determined by several elements, the most important of these being melanin (specific skin pigments) and hemoglobin (blood pigment). The quantity and distribution of melanin in the uppermost layers of the skin determine how light or dark the skin is. There is a "natural" degree of pigmentation that is genetically decided, with additional factors such as tanning (hyperpigmentation caused by sun exposure) and pigmentation disorders (excess – hyperpigmentation; deficit – hypopigmentation). According to their spread, pigmentation disorders are generally classified as diffuse or localized. The term "hyperpigmentation" is used for a number of disparate pigmentation problems. Hyperpigmentation of the skin can be caused by excessive quantities of melanin in the skin's uppermost layers. But it's also an abnormal distribution of melanin that causes what is commonly known as "pigmentation spots". Hyperpigmentations are often a reason for consulting a dermatologist, especially when exposed areas of the body are concerned (the face). 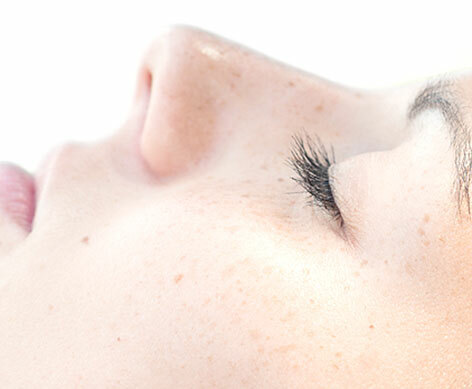 Before any treatment, it is crucial to determine the exact cause of a pigmentation spot. Melasma and lentigo are two of the most common forms of hyperpigmentation. Melasma, also called "the pregnancy mask", is a form of hypermelanosis that generally appears symmetrically along areas exposed to the sun (the face in particular, but also the arms and neck). Moreover, exposure to the sun is a major factor in the worsening of the condition. The onset of melasma is directly linked to hormonal changes which occur when taking oral contraceptives or during pregnancy, but can also result from a particular genetic predisposition. Certain populations and people with dark skin (phototype IV or greater) are therefore more frequently affected than people with clear phototypes. Everyone has seen those little dark spots that appear on the face, neck and hands of older people. These "age spots", also called lentigines or solar lentigines, are a direct result of sun exposure and one of the first signs of cutaneous (photo)aging. The first lentigines usually appear in a person's forties, and they are more common in people with light skin. They do not pose any danger to health but they should be monitored and protected from sun exposure to prevent them from being transformed into cancerous lesions. Once considered to be inevitable consequences of aging, these hyperpigmentations can now be lightened using various dermatological techniques. The therapeutic demand is high because these spots go against common beauty ideals that place emphasis on an even skin tone. Which topical products can be used to fight against hyperpigmentations? Hyperpigmentations have always been considered very difficult to treat, no matter the cause. Several topical agents have proven effective to some extent, but the success rate varies according to the products used and the length of treatment. Dermo-cosmetic anti-dark spot products can be used to reduce hyperpigmentations and potentiate the effects of topical agents. These molecules are safe to use and good efficacy is obtained if the treatment is maintained over time, along with responsible behavior in terms of limiting sun exposure (using sun creams), the main trigger factor for hyperpigmentations. Besides topical products, are their other options for treating hyperpigmentations? Chemical peels and cryotherapy are the proven methods of treating pigmentation spots. A chemical peel involves applying a chemical substance to the skin to remove the uppermost layers, thus eliminating the cells that contain melanin. In this way, the skin becomes lighter in the entire area treated. There is a wide variety of products available that can be adapted to obtain the expected result. A specialist should be consulted nonetheless; don't forget that a peel can often provoke unpleasant short-term effects (ranging from discomfort to pain), some of which are plainly visible (erythema, edema, desquamation). A chemical peel can also trigger major complications, especially if performed on the deeper layers of the skin. In dermatology, cryotherapy (cold treatment using liquid nitrogen) is frequently used to treat warts, but it is also effective in treating lentigines. Where do laser treatments come in? Lasers can be a safe and effective therapeutic option for treating several skin blemishes, provided that the treatment is performed by an expert dermatologist in the field. Lentigines are a prime indication for pigmentation lasers, which generally produce very satisfactory results. However, the use of lasers for melasma is a controversial issue since recurrence is a common problem; laser treatment can even aggravate the hyperpigmentation. How can we effectively conceal hyperpigmentations? Hyperpigmentations have always been considered very difficult to treat, no matter the cause. Even so, we can effectively and discreetly conceal hyperpigmentations by using specific, adapted medical make-up. Severe blemishes are often difficult to conceal and excessive make-up creates a "mask" effect. Color correction must be used for an effective, natural result when concealing. Applying a concealer stick with a coral color helps effectively neutralize the brown color of melasma and lentigo spots. Thanks to this technique, less foundation can be applied, which gives make-up a lighter, more natural look.